Free shipping to United States with $25 purchase from JewelrybyJakemi. See item details below for sale terms. 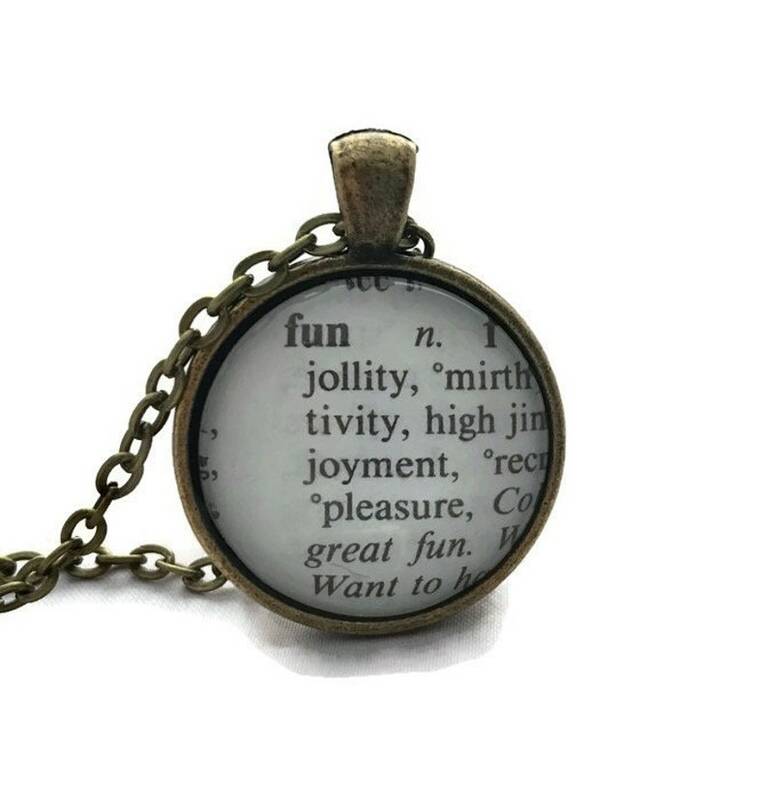 This necklace (or keychain) is made using your choice of vintage looking bronze or silver plated chain and the word FUN cut from an actual dictionary (not photocopied or printed from a computer). Necklace can be personalized with an initial charm. The paper is protected with a layer of resin and domed glass that slightly magnifies the writing. The necklace is 24" long (which can be shortened at your request) and has an easy to use lobster claw clasp. The charm is 30mm (slightly more than 1") in diameter. Each necklace comes in a pretty organza pouch, perfect for gift giving (or keeping)! All jewelry is lead and nickel free. Received it today and already wearing it. I love the necklace and am excited to show it off. The jewelry was disappointing and looked like it came from a box of fruit loops. The price was very low. I guess you get what you pay for. I was very sorry to hear that you were disappointed with your purchase. I strive to make only items that I would be proud to wear myself and that will bring joy to those that receive them. However, should a customer be dissatisfied for any reason, returns are gladly accepted as stated in my policies.